Learn how to make your capeting and flooring last for many years to come. Our free report shows you how. 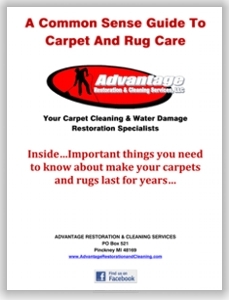 It's called "A Common Sense Guide to Carpet and Rug Care." In it you will find important information you need to know for effective flooring maintenance. It also is full valuable coupons you can use toward your next carpet, rug or upholstery cleaning. As an added bonus, we will also send you our Home Floor Care Tips eNewsletter. This is emailed to you about once a month and has home care tips and special seasonal offers that will save you money. To recieve your free guide and get the enewsletter fill in this form with your email. Your privacy is very important to us. Your name and email will never be given or sold to anyone else. We hate spam too!